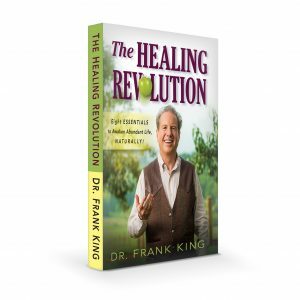 The Healing Revolution® is all about helping you awaken the healing powers within you. It’s about tapping into the life of abundance and joy that is your birthright. The Eight Essentials provide an easy-to-follow path to get there. They are the heart and soul of The Healing Revolution. These empowering natural health techniques are all free. Yet they are the most transformative tools of change I have ever witnessed. Plus, they have been tested and proven to work during my 40 years of sharing them with patients. Only when these Eight Essentials of life are integrated into our lives can we live to our fullest potential. Isn’t That a Lot to Manage? Here’s what I tell them: Devoting some energy to each of the Eight Essentials is actually easier than devoting all your energy to just one. Imagine the Eight Essentials as the eight legs of a spider. If you take away seven of the spider’s legs and give him just one to stand on, how easily can he move through life? Not easily at all. Every movement is a struggle. Now think about your own life. If you’re focused on fitness, but not nutrition, sleep, or water, you’re not going to lose weight. Why? Because all the essentials are part of a whole. Unless you address them holistically, you’ll drag yourself through life – just like that one-legged spider. When you start implementing the Eight Essentials, you may be surprised to learn that you don’t have to work nearly as hard as you did when you focused on just one area of health. And more importantly, you will find that your efforts pay off in ways you have never experienced before. You will see improvements to your overall health, whereas your past approaches only benefited small segments of your life. Think of those ultra-marathon runners who torment their bodies so much that they sustain a permanent athletic injury. Or yo-yo dieters who give up because they can’t lose weight, no matter how much they deprive themselves. These people crash and burn because they work so hard in one essential area of life while neglecting the others. With the Eight Essentials, you can make small, positive, life-affirming changes in each of the areas and see the results multiply. You’ll start moving through life with less effort and struggle – just like that spider, with all eight legs working together. Are you ready to improve your health beyond your wildest dreams in just eight weeks? Be empowered to make 2019 your best year ever. Beginning the second week in January, each week, we’ll post a new article on one of the Eight Essentials to our website. Read them and implement a few small steps each week. You will be surprised how much more you can achieve with a whole-person approach than you ever did just focusing on one or two of the Eight Essentials. The empowering techniques I share in the Eight Essentials have transformed tens of thousands of my patients lives. As we post each article, the link to it will appear on the same title listed in the Eight Essentials chart above. Or, you can check our Facebook page, King Bio Natural Medicine, or our website Home page under Resources for all articles. Learn much more than we can share in these short articles. Buy the book!